S is for Sibling, Annie Graham? 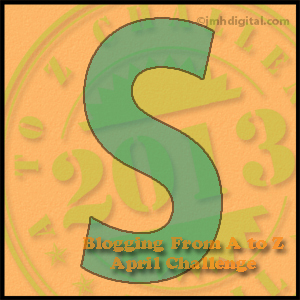 This is the 19th post for the April A-Z Challenge. Finding a small New Testament inscribed to Jacob Graham in my grandfather Mershell C. Graham’s belongings raised questions that I am still trying to answer. To read what I wrote earlier, follow these links, Jacob Graham, Abraham Graham, and William Graham and Mary Jackson. I have been unable to connect any of them with my grandfather with more than circumstantial evidence. 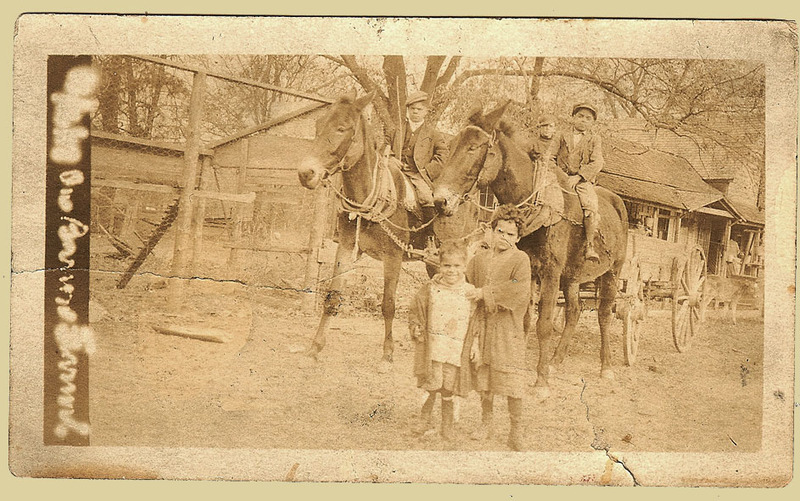 Today I’m going to write about Annie Graham, another possible sibling of my grandfather Mershell C. Graham. Annie was born in 1885 in Elmore County, Alabama. 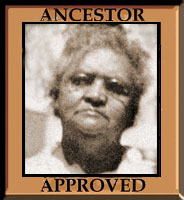 She first appeared in the 1900 Census with Zacharies, Abraham and Jacob in Robinson Springs, Elmore County, Alabama. She was 15 years old, was literate and attended school within the last year. Annie’s first son, Clyde Graham was born in 1905. William was born in 1906 and Emma Mae was born in 1907. In the 1910 Census Annie and her children were living in the household of Oscar P. Barron and his wife Emma (Jackson) Barron. as servants. Annie was listed as a cook. She was listed as a widow and she and her children all used the surname Graham. The Barrons were identified as white and the Grahams were listed as mulatto. Emma was the daughter of Absalom Jackson. 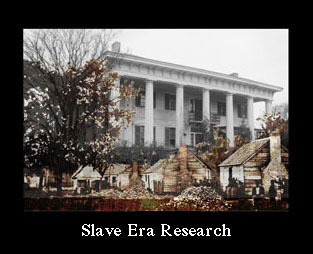 He owned a large plantation in Autauga County, Alabama. In 1865, Elmore County was made from part of Autauga. In 2002 I wrote to a descendent of Absalom asking for a copy of the names of slaves owned by James Jackson and divided among his heirs after his death in 1832. I thought that these Jacksons may have enslaved my Jacksons. I wasn’t able to make a connection between the Mary Jackson that may be my grandfather Mershell’s mother and the list at the time but I think I should take another look. That was 11 years ago! In 1860 Absalom Jackson held 62 slaves and lived in Robinson Springs. Emma Boling Jackson married John Zimmerman in 1867. They had two children. He died in 1873. In 1879, she married Oscar P. Barron. They lived in Robinson Springs, AL. It was in their household that Annie and her children were living in 1910. In 1911 Annie gave birth to her fourth child, a son named Michele. Another story, my mother told us that her father, Mershell, had been named Michele by his mother but that when he was a child he was a servant to a little white girl. He had to sleep on the floor outside of her room in case she needed anything. She said Michele was a foreign name and she changed it to “Mershell”. So, Annie’s youngest son was named Michele. This is an unidentified photograph from my Graham Photographs. I don’t know if any of Annie’s children are in the photo. A few years ago I tried to make out what was written underneath, which isn’t easy. For more information about the camera used to take this photo follow this link to the Photo-Sleuth’s post about the Autographic camera. In 1920 Annie and her four children – Clyde 15, William 14, Emma 13 and Michele 9 were again living in the household of Oscar Barron and his wife, Emma. The household has swollen to include a daughter and granddaughter, husbands and children. Annie is listed as a servant working on her own account. That means she’s not getting wages, but in this case I don’t know what that even means. Her three oldest children are listed as “helpers”, the boys as farm labor. Michele is listed as an “errand boy”. Once again the Grahams are all identified as “mulattoes” and the Barrons as white. All of the Barrons are literate or in school. Annie is literate but none of her children are and none of them are in school. In the 1930 Census Annie is living with two of her sons next door to the Barrons. Emma Barron is dead but her daughter, Emma Powers, is running the house and Annie is working as her servant. Clyde, 25 and Michiel 16 are both working as laborers doing general farm work. Both are still illiterate and both are now using the surname of “Jackson”. Annie is listed as single and still a Graham. William is not to be found. Emma is now married to Captain Reeves and still living in Elmore County. Emma is also using the name “Jackson” on her marriage record. I cannot find Annie, William or Michele in the 1940 census. Clyde 35, is married to Edith 29. They have four children, Hettie May Jackson 8, Clyde Jackson 7, William Jackson 4 and Alice Lee Jackson 4/12. He’s never attended school and earned $250 the previous year in the private sector working 52 weeks. They are still living in Robinson Springs, Elmore County. Emma was still married to Captain Reeves and they have surviving no children. Their one son, Clyde Junius Reeves lived one month, born in November and dying in December of 1927. She had 0 years of schooling and her husband had 3. She’s keeping her own house, for no pay. He is farming his own land. Annie died in 1964 of a stroke. Her parents are listed as William Graham and Mary Jackson. Her daughter, Emma is the informant. She died in Elmore County and is buried in the Jackson Cemetery in Coosada, Elmore County. Emma died in Columbus Ohio in 1993. Her work was cleaning houses. She was an 86 year old widow. Her father’s surname was “Jackson” and her mother’s maiden name was “Graham”. She is buried in Jackson Cemetery, along with her husband. Clyde died in 1965 in Montgomery of heart disease. His father is listed as Paul Jackson and his mother as Annie Graham. He is buried in Long Cemetery in Coosada, Elmore County. And with that, I end for now. So tantalizing to have a number of threads of evidence that associates people with your family, but no definitive proof. Do you have a hunch that Annie was in fact your grandfather’s sister? What is the strongest piece of evidence? And how did you get the idea in the first place? I like the Michele/Mershell story. And then how is it that Clyde and Michele start using their mother’s surname of Jackson? Was that a common thing if the father died or went away. Then there’s Emma Jackson Barron and Annie’s daughter Emma. Again, so tantalizing. You must often feel that you’re hovering on the brink of some understanding that is eluding you. And occasionally, you probably see something very clearly all of a sudden. Annie’s maiden name was Graham. She never used the name of Jackson. Her mother was Mary Jackson. 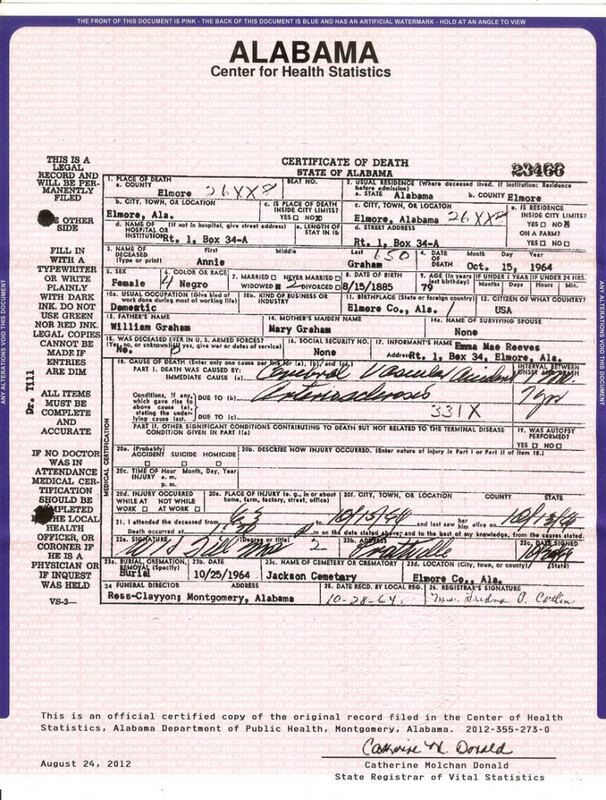 Her children went with her maiden name until they were grown and then they began using Jackson, which was the name of their father, according to their death certificates and marriage records. I don’t believe Annie was ever married to Paul Jackson. Her children decided to go by his name when they grew up, I don’t know why. There are a few Paul Jackson’s in the area so, again, I don’t know which one was their father. When I found the Bible with Jacob Graham’s name in my grandfather’s stuff, I investigated him and found him in 1900 with Abraham and Annie. I knew that my grandfather had a sister with several children. They all have the same parents listed on their death certificates. I guess I need to do a chart or something to simplify it. I’m afraid I may be confusing the issue more! At least I finally wrote it all down, now to make it clear. I love that old photo. 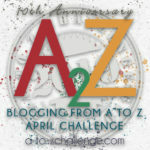 I have saved the link and will be reading about the Autographic camera’s too (as I have a number in my collection). It was very interesting to find that people were out taking snap shots that early on.